Sleep apnea refers to lapses in breathing while you slumber, which trigger distress signals to be sent from the brain and through the nervous system that alert you to awaken. Because this can happen several times throughout the night, you can be left with a serious sleep-deficit, and often, you won’t remember these episodes. Age – As you get older, the muscles in your throat can go through a natural form of atrophy and can also loosen. The result is weaker and less responsive musculature, which can lead to a partially blocked airway. Obesity – Weight gain can also cause OSA by adding girth to the neck and throat that restricts the flow of oxygen. Smoking – For regular smokers, there is a greater risk of developing OSA. One of the reasons is that smoking causes inflammation and fluid retention in the upper respiratory system that can lead to poor air circulation. Enlarged Tonsils – The leading cause of OSA is an enlarged set of tonsils. When they fall back into the airway, they hinder the natural flow of oxygen. Frequent Alcohol Use – Drinking alcohol on a regular basis causes the throat muscles to relax, which restricts the airway. A less common type of apnea is CSA, which involves miscommunication between your brain and your respiratory system that can cause frequent lapses in breathing throughout the night. The most complex form of apnea is MSA, which is a combination of OSA and CSA. It can be brought on by a host of health issues. Thankfully, your sleep dentist has ways to treat all forms of apnea. The most commonly used method of treating sleep apnea is for patients to wear a special mask connected to a CPAP (continuous positive airway pressure) machine, which forces air into the throat during the sleep cycle. It is the most common form of treatment for OSA. Another option for treatment is an oral appliance, which is custom-designed by your dentist to help to reposition your jaw so your airway remains open while you sleep. For patients who suffer from MSA, studies show that one of the more effective strategies is to use a combination of the CPAP machine and an oral appliance. 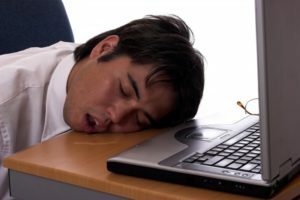 If you notice that you feel lethargic, unusually irritable, unable to focus or depressed, you could be suffering from sleep apnea. The first step to getting relief is to alert your doctor so a sleep study can be conducted. Then with that information, you can move forward with getting the treatment you need. Dr. David G. Banda earned his dental degree from the University of Michigan. Throughout his nearly 30-year career, he has remained an advocate of learning; thus, he’s taken countless hours of continuing education. Dr. Banda combines his years of experience and advanced training to provide patients with relief from sleep apnea at Cranbrook Dental Care, and he can be reached for more information through his website. by: Dr. David Banda at December 10, 2018 .